Kamikaze Kaitou Jeanne anime and manga series by Tanemura Arina images and info. 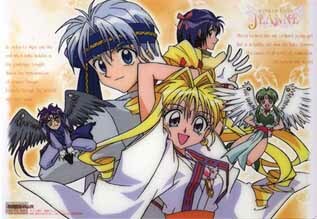 Part of a diverse shoujo anime, manga, video gaming, and live-action Japanese drama website. "Kamikaze Kaitou Jeanne" is an intriguing and slightly dark historical/religious mahou shoujo story by Tanemura Arina, which ran in the manga magazine Ribon. The story is compiled into 6 manga books. Kusakabe Maron seems like an ordinary high school girl, but lives alone with an angel named Fin Fish and is actually a secret agent of God. She is a reincarnation of the legendary Jeanne D'Arc, or Joan of Arc. Using heavenly powers she fights demons who have possessed people and when she catches a demon, it turns into a chess piece. However, the way she does this seems as if she's stealing valuable paintings. The demon will reside in a piece of artwork, and Jeanne throws a pin into the picture to stop it. Afterwards, the painting turns into a beautiful portrait of an angel. Maron's best friend Miyako doesn't know that she is secretly Kaitou Jeanne, and is always trying to catch Jeanne since her parents are police officers. Miyako's family and Maron live in the same apartment building. Maron lives alone because her parents are working overseas. 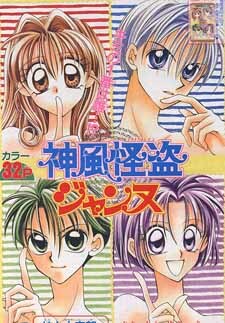 One day Maron & Miyako meet a good-looking guy named Chiaki who is moving into the same apartment building. It turns out he's in their class at school and is secretly also a Kaitou, but on the opposite side of Jeanne. Chiaki has a helper angel named Access Time. His secret identity is Kaitou Sindbad, and Jeanne soon discovers they are rivals when he throws his own black pin into one of the paintings and takes the chess piece for himself. 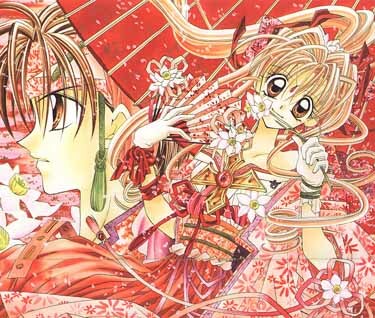 Meanwhile, Chiaki really likes Maron and she finds herself being drawn into a romance - even though she thinks he's obnoxious, he's quite good-looking, caring, and protective. Miyako likes Chiaki as well and openly shows it. The story starts to develop into an even bigger picture with the appearance of the demon knight Noin, his dragon friend Silk, and a mysteriously tragic boy named Zen. It seems Noin has ties with the Joan of Arc from long ago and wants to get closer to Maron. Maron finds herself in a dream of the past when Jeanne is about to burned at the stake. Can Maron save her? Should she? This dark mahou shoujo story has exquisite artwork and is very intriguing, witty, and original, while barrowing ideas from the kaitou series Kaitou Saint Tail and Cat's Eyes.